PASADENA -- Braving intense radiation, a NASA spacecraft reached Jupiter on Monday after a five-year voyage to begin exploring the king of the planets. Ground controllers at the NASA Jet Propulsion Laboratory and Lockheed Martin erupted in applause when the solar-powered Juno spacecraft beamed home news that it was circling Jupiter's poles. The arrival at Jupiter was dramatic. As Juno approached its target, it fired its rocket engine to slow itself down and gently slipped into orbit. Because of the communication time lag between Jupiter and Earth, Juno was on autopilot when it executed the daring move. 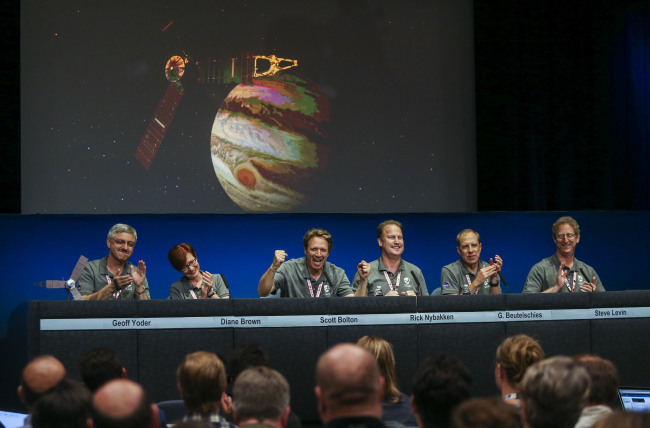 "Juno, welcome to Jupiter," said mission control commentator Jennifer Delavan of Lockheed Martin, which built Juno. The spacecraft's camera and other instruments were switched off for arrival, so there won't be any pictures at the moment it reaches its destination. Hours before the encounter, NASA released a series of images taken last week during the approach, showing Jupiter glowing yellow in the distance, circled by its four inner moons. Scientists have promised close-up views of the planet when Juno skims the cloud tops during the 20-month, $1.1 billion mission. The fifth rock from the sun and the heftiest planet in the solar system, Jupiter is what's known as a gas giant -- a ball of hydrogen and helium -- unlike rocky Earth and Mars. Named after Jupiter's cloud-piercing wife in Roman mythology, Juno is only the second mission designed to spend time at Jupiter. Juno's mission: To peer through Jupiter's cloud-socked atmosphere and map the interior from a unique vantage point above the poles. Among the lingering questions: How much water exists? Is there a solid core? Why are Jupiter's southern and northern lights the brightest in the solar system? "What Juno's about is looking beneath that surface," Juno chief scientist Scott Bolton said before the arrival. "We've got to go down and look at what's inside, see how it's built, how deep these features go, learn about its real secrets." There's also the mystery of its Great Red Spot. Recent observations by the Hubble Space Telescope revealed the centuries-old monster storm in Jupiter's atmosphere is shrinking. Along the way, Juno became the first spacecraft to cruise that far out powered by the sun, beating Europe's comet-chasing Rosetta spacecraft. A trio of massive solar wings sticks out from Juno like blades from a windmill, generating 500 watts of power to run its nine instruments. In the coming days, Juno will turn its instruments back on, but the real work won't begin until late August when the spacecraft swings in closer. Plans called for Juno to swoop within 3,000 miles (5,000 kilometers) of Jupiter's clouds -- closer than previous missions -- to map the planet's gravity and magnetic fields in order to learn about the interior makeup. Juno is an armored spacecraft -- its computer and electronics are locked in a titanium vault to shield them from harmful radiation. Even so, Juno is expected to get blasted with radiation equal to more than 100 million dental X-rays during the mission.